So much has happened this year. I started with one book written and a second started. I ended the year awaiting the publication of the first book, Bright Sword, in four weeks time. 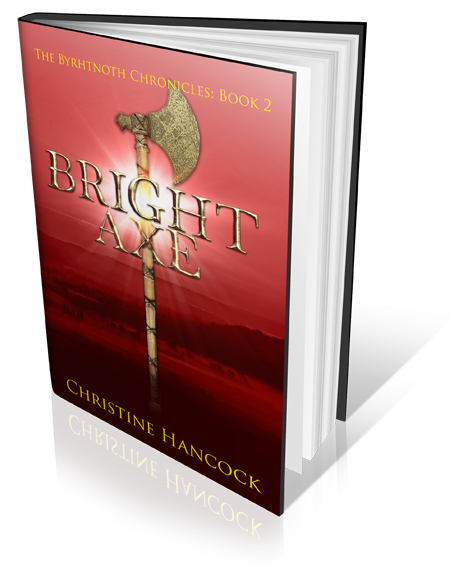 The second, Bright Axe (probably) is with beta readers and a third, yet to be named in progress. How did all this happen? By January, I had received my first feedback for Bright Sword. The book was OK but contained lots of errors. I knew it needed a professional edit and made arrangements. In February, I seem to have done nothing much except write, and start to think about publication. I was planning on self publishing – When? How could I do it? There was one landmark this month, another author asked me to write a preview of his book, before publication. This was Kin of Cain, a short book (100 pages) by Matthew Harffy. This was an easy job, it was so good; better, if that is possible, than his other books in the Bernicia Chronicles series. Read my preview here. March was spent worrying about how many corrections I would receive from my editor. At the beginning of April I got the manuscript back. Not too bad, but my punctuation appeared to be even worse than I thought. There was a bit of discussion about one of the characters and in the end I added a couple more scenes – only about a hundred words or so. At the end of that month, I attended the Self Publishing Conference, to make a final decision about which avenue to take. There are so many different options nowadays, that I ended up more confused than ever. Someone suggested The Book Guild. You don’t need an agent, or to prepare a synopsis (although I had one). Just send your complete manuscript and they might offer one of several options. I had nothing to lose. In May, as I struggled with the ending of book two, a bombshell struck. A (very) famous author, Conn Iggulden had published a book set in exactly the same period I was writing (mid tenth century). It was about Dunstan, who appears, briefly, in my book. What could I do? I read the book and wrote a review. I didn’t think much of it, although other people raved over it. Was I jealous? Perhaps, but I’ve put it behind me now. At the start of June I heard back from the publisher. They wanted to publish my book. They offered me a partnership deal, which I accepted. I was on my way! It was in June that I finished the first draft of book two (104,542 words) and started editing. I also went on holiday – an archaeological tour of Orkney and Shetland. It was somewhere I had wanted to go for a long time, and since it was our 40th wedding anniversary this year, I managed to persuade my husband that he would survive the ferry journey. Luckily the sea was calm and the weather beautiful. I learned a lot about pre-history and Vikings, but there was not much about Anglo-Saxons. I took lots of photos which can be found on a series of posts, starting here. 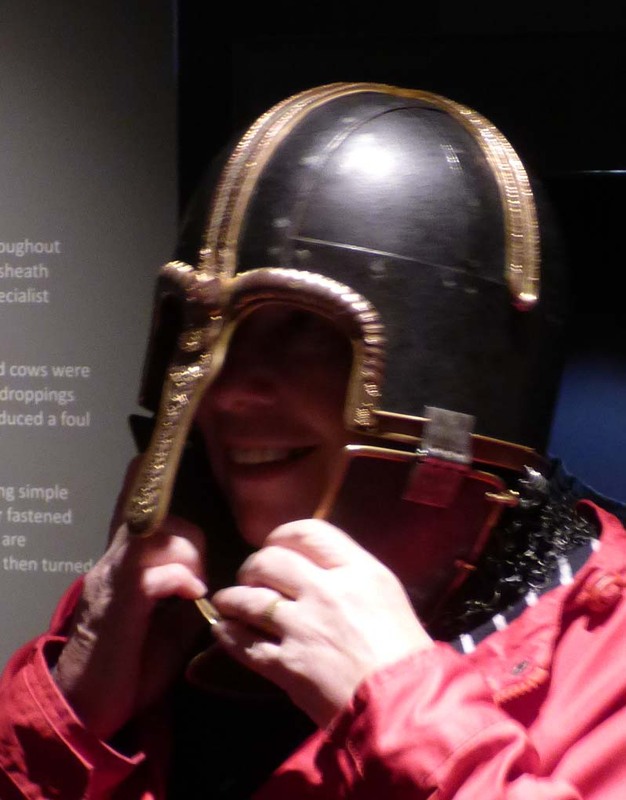 Coppergate Helmet, modelled by the author. At the end of August, proofs arrived. A whole new experience. It was at this, rather late, point that I discovered that I had been let down by my editor. All those punctuation mistakes that had been pointed out, were not mine. Most of them had been OK and I had “corrected” them to something wrong. Details here. It was nearly a disaster. It was a big job to rewrite the book and search for other errors at the same time. There were several runs though and gradually I signed off on the final half dozen errors. I never wanted to see that book again! September was busy, writing reviews of books, finding people to review mine. I volunteered to review Viking Fire by Justin Hill. A great book reminiscent of Dorothy Dunnett. 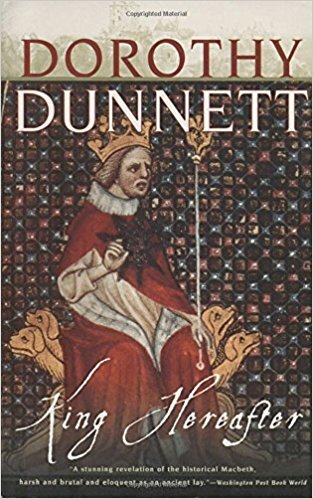 I had reviewed her book, King Hereafter, in July but in September was noticed by the fanatics (in the nicest possible way) of the Dorothy Dunnett Society, making it my most popular post this year, at 168 views. It was also September when I found Bright Sword was listed on Amazon. I thinks it was at that point that I knew it was really happening. In October, author G K Holloway approached me out of the blue to review his book, 1066 , What Fates Impose He has since reviewed mine and beta read book two – it’s better than Bright Sword apparently. It was in November, with Bright Sword on track and book two on pause, I started book three. It is causing a few problems, which I’ll talk about another time, but I have written just over 30k words. With preparing for Christmas, setting up launch events, etc and writing; book and blog posts, I have been busy. I have taken a week off for Christmas, read a few books, and now stand on the edge of a new year. Where will I be this time next year? I’ll write a few thoughts about that tomorrow – if I am in a fit state. Writing update for the year: I have written about 118K words of historical fiction. Words deleted and edited – unknown, but a lot. I have written 53 blog posts – more than one per week. Say an average of one thousand (this is 1166) makes 53K. Total 171K. No wonder I’m feeling tired! Thank you to everyone who has helped/supported/encouraged me during this amazing year. In 2018, may you finish/publish/sell your own books – and if you don’t write; read and add a review to someone else’s. Just so long as it’s called Bright Sword! FAREWELL 2017 – HERE I COME 2018! I don’t know why I never read any of Dorothy Dunnett’s books. I was aware of her as an author – I had noticed a set of books set in 15th century Italy, but it was not a period that interested me. It was only once I started to write myself, and take notice of what other authors thought, that I realised that many writers of historical fiction revered her. I wanted to find out why. Two years ago I bought a copy of King Hereafter. I started reading and knew that this was something special. It is a long book, over 700 pages, and I was busy. I wanted time to savour it, so I put it to one side. Recently I came back to it and last night I got to the end. I am still held in its spell and want to get down my thoughts while they are fresh. For those who have never read it, this is the story of Macbeth, but not Shakespeare’s Macbeth. This is the real man, Thorfinn, Earl of Orkney, who might have become King of Scotland, if Scotland had existed at that time. Because of him, it nearly did. It is the story of one man’s life, but also the story of a whole world. The Macbeth we think we know is set in Scotland, a country north of England. This book opens out to reveal the whole world; of the interconnections between countries when borders were fluid, of families connected by blood and marriage, where who you married was sometimes more important than who your father was and cousins could be friends or enemies depending on circumstances. Thorfinn is sent to England, to the court of King Canute and his wife Emma, who controls events like a spider in a web. He meets Earl Leofric of Mercia, and his wife Godiva (who had ever considered that Macbeth probably met Lady Godiva?). Thorfinn is an heir to Orkney, he must fight for his share. Later, he gains Alba, by battle and keeps it by marriage to the widow of the previous king. It becomes a great love story. Movement is central to the story. The action moves, with Thorfinn, not just across Scotland and the isles, but to Norway and Denmark. There is a long journey to Rome to meet the Pope. Always Thorfinn, plans, makes alliances. It is only towards the end of this trip that you realise that one reason for the journey is to bind together the young men who will be the leaders of the future, the heir of his ideas, if not his body. The book is about religion. Not just the conflict between Christian and Pagan, but the different branches of the church. It is important that the bishop that controls your priests, is consecrated by the right person, for whichever king controls him has power over you, and your country. I was astounded by the authors breadth of knowledge, how could she know so much about the period. I had occasion to look up some fact (I think it was the date the “historical” Macbeth died.) and found that there are little known facts about his life. In fact, the merging of the characters Torfinn of Orkney and Macbeth the king is only speculation. But the world she has created, is so real that you believe it happened as she tells it, or if it didn’t, it should have. It explains so well the state of the world in the mid-eleventh century, the rise of Harold Godwinson in England, the battles of William for possession of Normandy, the arrival of that other Harold from the east, to take over the throne of Norway. Men who would meet a few years later, in 1066, to decide the direction history would take. But enough of history. If all the characters were fantasy, it would still be worth reading, so beautifully is it written. There are great set pieces; The firing of the hall at Ophir where Thorfinn and his wife nearly die and the storm, again on Orkney which acts as the trigger for the final downfall. Ligulf was smiling. The black moustaches opened like pincers. “No indeed,” Ligulf said. “So what were you thinking of? And smiled all the time that he listened, so that Siward thought the moustache-ends would be hooked on his ears. I could quote much more, but I haven’t the time, or space. I was dreading the end. I knew there would be death. The death of a man I had come to love. A man who had started with nothing, achieved so much with his strength and intelligence and lost it through forces he was unable to control. I delayed the last few pages, until I was alone. I knew I would cry, I am close to tears now. The ending was heartrending, but magnificent, the only way it could end. A man must die but his memory lives on. A quote from near the end, Thorfinn and his stepson Lulach, who sees things. I do not just cry for the death of a man. I cry because I now know that this is the sort of book I want to write – and I know I never shall. A book like this takes great talent and a lifetime of writing. It is too late for me. If I had read this earlier, would I have started writing earlier, or is it only now that I know a little about writing that I can appreciate it? Who know? I’ll just have to try my best – it’s all anyone can do.